AFC Fylde have signed left winger Danny Williams on loan from League One Accrington Stanley until January. The 30-year-old is set to make his debut in Saturday's National League fixture at Chesterfield. 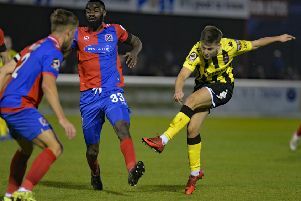 A native of Wigan, Williams played for a handful of north-west non-league clubs before moving north of the border in 2013 to Inverness Caledonian Thistle, with whom he won a Scottish Cup winners' medal and played in the Europa League. Williams moved on to Dundee in 2016. Having made over 100 appearances in the Scottish Premiership, Williams joined Stanley in January this year. His only appearance to date was in the League Two champions' 4-0 win at Wycombe in April. Williams played against his new club, in their former guise as Kirkham and Wesham FC, while he was with Daisy Hill 11 years ago. He said: “I’ve always followed the club's progress since playing against them in non-league. It’s remarkable what they have achieved.